In a large bowl or bowl of a standmixer, beat eggs until fluffy. Beat in remaining ingredients until smooth. Pour the manufacturer's recommended amount of batter onto center of the hot waffle iron. Close lid of waffle iron. Bake about 5 minutes or until steaming stops or the iron beeps. Carefully remove waffle. Serve immediately or keep warm in a 200° oven. Repeat with remaining batter. Today is waffle day in Sweden and while these aren't Swedish style waffles, it seemed fitting to share a new waffle recipe with you. (If you are interested in making traditional Swedish waffles, check out my recipe for Våffel here.) We have recently gotten back on the waffle train after our last waffle iron (not the cute heart one but another Belgian-style waffle iron.) broke and we couldn't find a new one that we liked. I hate cleaning waffle irons (I know, use a toothbrush. Whatever.) so when I found this one with detachable plates, I knew I had to have it. It is huge, making 4 squares at once (I freeze the extras and the squares can fit in a wide-opening toaster to reheat) and makes the best waffles. They are moist inside and crisp outside like a good waffle should be. And the clean up is so easy, I don't regret making waffles like I used to when I had a traditional waffle iron. 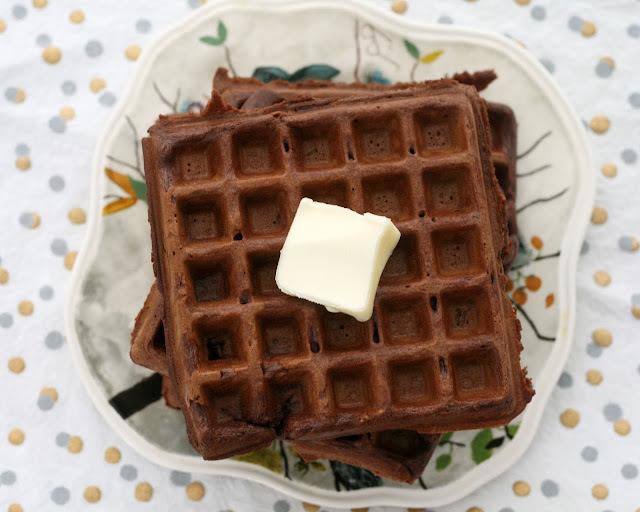 As for this recipe, if you are looking for a dose of not-too-sweet chocolate in the morning or a dessert waffle, this is the waffle for you! Chocolatey, moist and crispy, they hold up to butter, syrup and ice cream.